So far in The Fourth Doctor Adventures: The Syndicate Masterplan, Ann Kelso has battled aliens on her home turf and has visited an alien planet. She’s also met one of the Doctor’s old foes, granted they were Drashigs, but they still count. All that’s left for her to do on the Doctor Who companion bucket list is to visit the past and meet a historical figure. 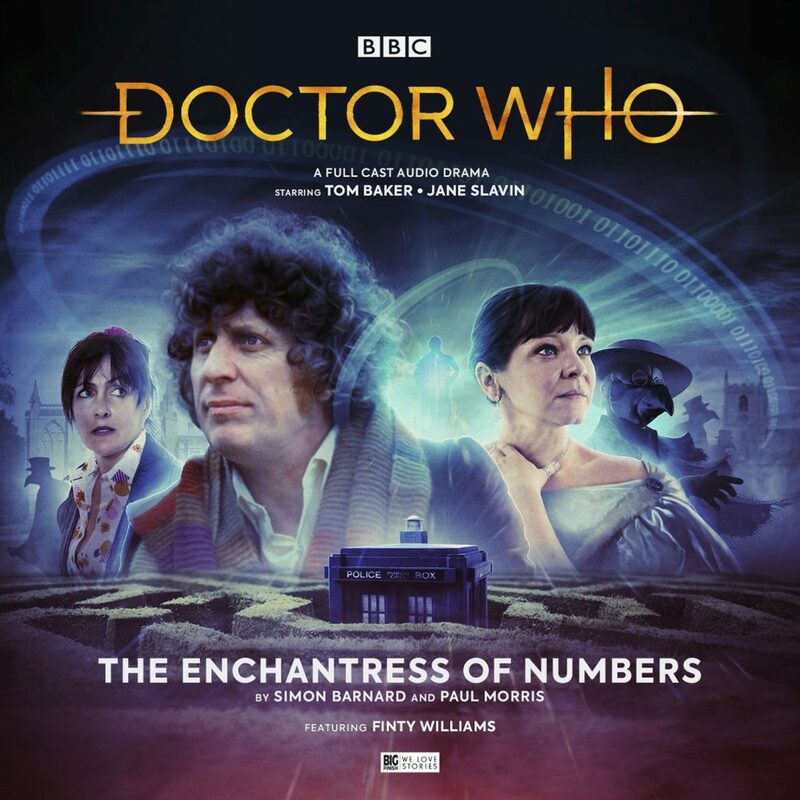 In the boxed set’s third adventure The Enchantress of Numbers, she gets to tick both those boxes. The historical figure in question is Countess of Lovelace, daughter of libertarian poet Lord Byron and the mathematician and great grandmother of modern computing, Augusta Ada King. Bedbound from exhaustion and haunted by images of both her father and strange bird faced men, the Countess soon finds herself at the centre of a plot that stretches hundreds of years into the future. Ada King would be a prime choice for the most recent television series, her brilliance and revolutionary thinking being undermined by her gender, not allowed into the boy’s club of the Royal Society. She and the Thirteenth Doctor would clearly get on well, and she and the Fourth Doctor get on like a house on fire. One of the story’s best scenes involves the pair playing a game of cribbage against the local barflies. Tom Baker and Finty Williams entertainingly bounce off each other in these scenes as each character learns more about the other through the course of the Doctor’s investigation. Writers Simon Barnard and Paul Morris concoct an engaging mystery which is already in full swing by the time the story opens. The Doctor and Ann have arrived at the Countess’ home in Newstead Abbey on the trail of disappearing scientists and, even more troublingly, buildings. This sort of story is perfect material for former WPC Ann Kelso, who gets to team up with an uncharacteristically helpful butler to investigate Newstead Abbey and the mysterious foreign gentleman who mooches around the grounds at the night. Unsurprisingly, given how she hit the ground running in The Sinestran Kill, Jane Slavin has really settled into the role of Kelso, a companion who can very much hold her own against the bohemian, occasionally bombastic Fourth Doctor. Her shrewd policewoman’s eye and detective’s training means that she’s incredibly adaptable to the situations she finds herself in. This, combined with the sort of gallows humour you expect from fictional coppers means that she’s never in thrall to the Doctor, which makes her a companion in the modern mould of post-2005 Doctor Who and yet, she is at home in the authentic 1970s feel of the stories in this set. In some respects, The Enchantress of Numbers is a bit like The Terminator remade by Christopher H. Bidmead, given its heavy mathematics, block transfer computations and future wars. And yet, there’s a chilling and spookily atmospheric tone to proceedings that means it sits more comfortably alongside The Stones of Blood than it does Logopolis. The Doctor and Ada’s visit to the family crypt is effectively realised in the sound design, so much so that it may set the hairs on your neck on end during your commute or wherever you listen to your Big Finish’s. Whilst, much like Planet of the Drashigs, this story bears no connection to the overall arc, it’s an entertaining diversion with a snappy script, solid scares and terrific performances that sheds some light on one of mathematics, and history’s under-appreciated figures. Which, if we’re honest, is what this wonderful show has always been so good at and what, on a good day, Big Finish is great at replicating.